TS Schools New Academic Calendar 2018-19 Programmes, Activities PS, UPS, HS New Timings, Exams Schedule Holidays, Closing day, Reopen day, Schools Timings, School Games, School Complex Meetings Schedule. TS SCERT Schools Academic Calendar for 2018-19 Summative Assessment Formative Assessments Examination Schedules Month wise Number of Working Days Activities Subject wise Syllabus distribution Time Table for Primary Upper Primary and High Schools in Telangana. Short term Holidays Dates School Timings for PS UPS HS in Telangana State. School Complex Meetings Schedule to be conducted Work Distribution among the Subject Teachers in the SchoolsTS Schools New Academic Calendar 2018-19 Programmes, Activities PS, UPS, HS New Timings,Exams Schedule, TS Schools Academic Calendar 2018-2019 rogrammes, Activities Schedule, TS Schools New Academic Calendar 2018-19 Programmes, Activities Schedule.TS Schools Academic Year 2018-19 . FA 1,FA 2, FA3,FA4 SA1, SA2 Exams Schedule, First Term Holidays ,Second Term Holidays, month wise working Days. 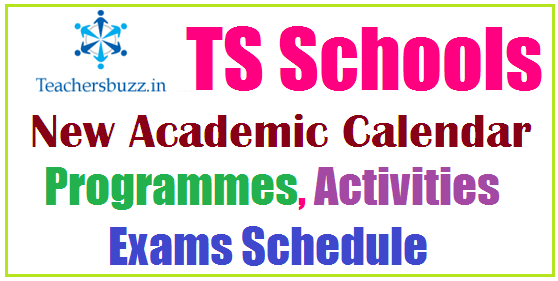 SCERT TelanganaTS Schools Academic Calendar for the year 2018-19 and other programmes, activities for the academic year. Main Activities Schedule, Next Academic year start date, Summer vacation, Schools Reopening, Syllabus distribution, Examinations schedule, Term Holidays like First term holidays/Dassera holidays, Christmas holidays for Christian minority schools, Second term holidays/Sankranthi holidaysfor Other than Christian minority schools, Summer vacation and Month-wise working days. In the circumstances reported by the Director of School Education, TS., Hyderabad , Government after careful examination of the matter, hereby approve Academic Calendar for 2018-19 as detailed below. 31.01.2019 and take Revision classes and conduct Pre-final examinations before commencement of SSC Board Examinations. 28.02.2019 for classes I to IX. 16.01.2019 (5 days) – Other than Christian Missionary Schools – Second Term holidays. 28.02.2019 exams during morning session and preparation for the next exam under the supervision of subject teacher during After Noon. 24 · SSC exams during March 2019.